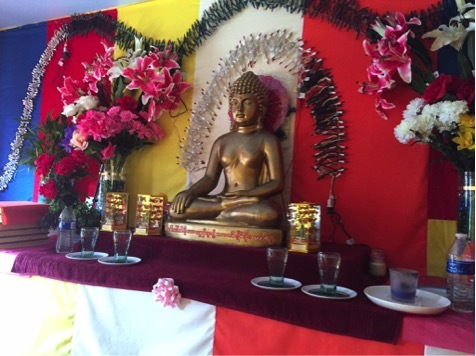 The Nandamala Buddhist Temple and monastery was dedicated in December 2014. It is currently led by Ashin Ko Sala, a Buddhist monk sponsored by relations in Utica to settle there and establish a new monastery. Ashin Ko Sala arrived in 2013 after teaching at a school in the Nu Po refugee camp on the central Burma-Thai border for five years. 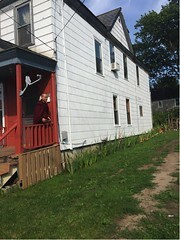 The monastery moved twice before settling in 2014 at the current location on Elm St. Nandamala is Utica’s second Burmese Buddhist temple; the first being the Santisukha Vihara Monastery. The monks at each temple visit each other for various services, classes and celebrations. The temple is financed entirely by donations from the Burmese and Karen Buddhist communities. 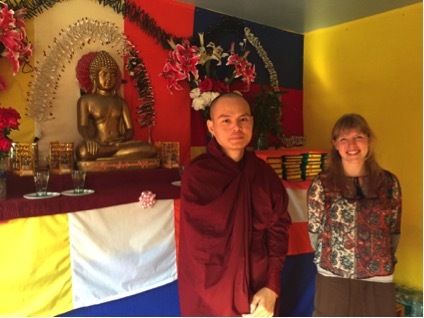 Ashin Ko Sala is also frequently invited to visit and teach in temples in the Midwest and Southwest United States. Nandamala is located on the second floor of a modest two family house in Utica’s Corn Hill neighborhood. The interior rooms are painted bright yellow with deep red borders. A spacious room used as a classroom and meditation space is walled with white-boards. Cushions and blankets are arranged on the floor around the room. There is also a small kitchen and a bedroom for monks. Another room houses a shrine with a golden Buddha image decorated with electric lights, flowers, Buddhist flags, water offerings, and neat stacks of books. Alongside a regular schedule of chanting and meditation, visitors come in and out of the temple throughout the day. Most people visit with their families, representing a broad range of age groups. For events like the temple’s Opening Ceremony, up to 200 people may attend. One of the community’s goals is to be able to include a broader swathe of Utica community members by teaching classes on Buddhism and meditation in English. Ashin Ko Sala is learning English at Utica’s Adult Learning Center and plans to begin offering more educational programs, especially for children, in the near future. In addition, he hopes to publish newsletters to inform the community of current events and programs.